FOSS has received this response from TRCA to questions we had concerning the recent Canada Geese roundup at the park, the dead Red-Necked Grebe found in the marina and the possible absence of some of the grebe parents from the nesting platforms. "The Toronto Region Conservation Authority undertakes an annual round up of Canada Geese during their summer molt due to the conflicts that arise because of increased goose densities at waterfront sites (geese that are not "Toronto residents" come to the Toronto waterfront to molt, which increases the population and therefore conflicts). It must be done at this time as this is the period when the birds are flightless - if they can fly it is impossible to round them up. 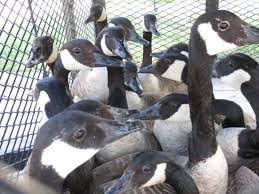 These geese are then sent via climate controlled trailer to a rural location with plenty of food and water where they can complete their molt and not cause problems as when they are in an urban area. Mute Swans, as well as geese with young, are not included in the round up, although sometimes they can get mixed in with the flock, but are separated out before they are loaded into the vehicle. No birds are ever killed as part of the round up. Only a few geese were present in the bay (the marina area), so round up activities were not conducted there. Efforts were concentrated around beach area where most geese were loafing. Geese that are in the water are slowly herded with small boats towards the beach and an awaiting trailer. Any geese on loafing on land are corralled by people walking them to the trailer. All of this activity takes place strategically and in a controlled fashion so that geese are kept calm and do not "escape". In our opinion the round up would have had no effect on the grebes, who nest in the bay and typically do not use the offshore area. The more likely scenario involves disturbance from off-leash dogs and people. It is possible that Mute Swans are also implicated, although at this time of year its less likely since they should have completed their nesting attempts and are no longer territorial, but this is not always the case. We would also like to note that sometimes young birds, particularly waterfowl, can be poor first-time parents. It is possible that one of the parents abandoned the family due to inexperience, or due to a combination of disturbance factors. As for the dead grebe, we would only be speculating on its death, which could also be due to a combination of factors, or be a completely natural occurrence. 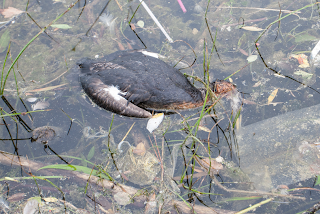 Unfortunately, we did not learn of the dead grebe in time to collect it for testing, but if anyone finds another dead grebe please advise us through Friends of Sam Smith Park asap so that we can collect it and try to determine the cause of death. The bird will need to be fresh and in good condition. We appreciate your concern for these birds and thank you all for keeping us updated. 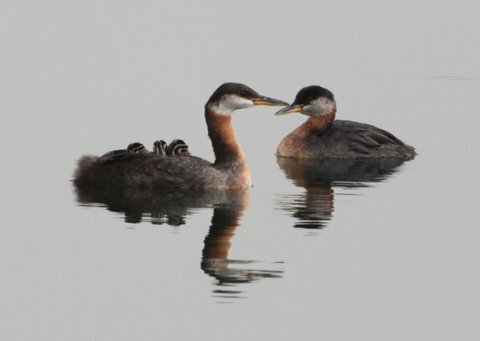 As you know, TRCA want to see the grebes succeed too and welcome any insights or suggestions. One strategy that we recommend is that you report off leash dogs (and other unauthorized activity) to the City of Toronto 311 service and include as much detail as you can (exact location, time of day, license plate of vehicle if possible). They have limited by-law enforcement resources and direct enforcement to areas that have the most concerns/complaints."